Finance is a standard part of business and impacts any and all decisions made by organizations. So it’s no surprise that when it comes to cloud computing and selecting a platform, companies want to not only get the best fit for their needs, but they want it to be the most cost-effective solution as well. 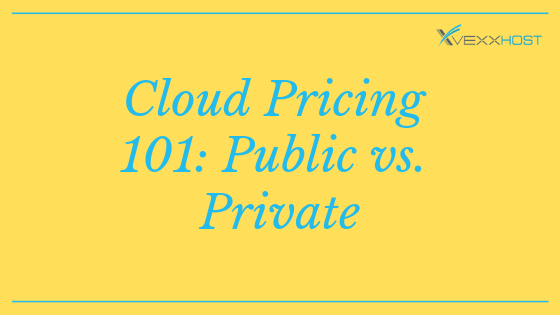 This is where the debate between public and private cloud pricing comes in. Public clouds can provide companies with access to a roughly limitless amount of infrastructure resources, in addition to access to technology that is considered to be at the forefront of the industry. These public cloud resources don’t come with mandatory upfront investments, however, the lack of control and level of security can be considered part of the tradeoff. With private clouds, businesses have an inherent control over their infrastructure, which alleviates some of the concerns surrounding security and regulations. That being said, true private clouds that enable virtualized resources to be self-provisioned by companies themselves are not the easiest to set up and manage. A public cloud solution has its own set of advantages when it comes to cost efficiency. Primarily, public clouds are considered to be the least wasteful deployment option due to the fact that they offer on-demand provisioning of resources. This enables the customer to avoid investments or capacity planning exercises altogether, a notable differentiator from private cloud deployment. Additionally, companies can save money with public clouds by sidestepping fees for management or support, and discounts are sometimes offered as well for longer-term contract agreements. In the case of private clouds, a key consideration where cost-efficiency is concerned is the utilization and management of those resources. If a company has frequently large workloads or processes sensitive data a private cloud can be the only option. This can positively impact their spend as it would be cheaper than the provisioning of resources involved with a public cloud. There’s also the aspect of a fully managed private cloud which, depending on the skill level and the number of IT employees, can alleviate the company’s spend on six-figure salaries. Essentially, cloud architectures are complex and their costs need to be visualized as part of playing a longer game. For companies, desired business outcomes are what should ultimately determine the choice of public or private cloud. Therefore, the option which is most cost-effective relies largely on the use cases, workloads and employee base of the business. With that being said, it’s more important than ever for businesses to select the right partner that can support and guide them through these decisions, ensuring that their cloud strategy delivers on both their needs and their budget. VEXXHOST offers public, private and hybrid cloud making it possible to tailor solutions to the benefit of each of our clients. We also provide consulting services to aid clients through the sometime overwhelming development of strong cloud strategy. Contact us for more information!